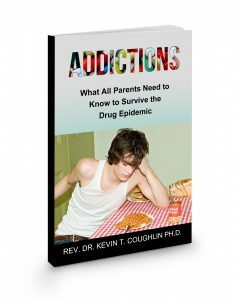 You are here: Home / Non-fiction / Educational/How-to / ADDICTIONS: What All Parents Need to Know To Survive The Drug Epidemic. by Author – Rev. Dr. Kevin T. Coughlin Ph.D.
Addictions: What All Parents Need to Know to Survive the Drug Epidemic is a must have for individuals, residential recovery programs, out-patient programs, professional recovery coaches, aftercare professionals, counselors, therapists, probation officers, ministries, recovery retreats, sponsors, sober companions, and family members to help them to get a deeper understanding of the disease of addiction, the solution to the problem, and the program of action that promotes change in the addict. A Support system for family and friends of substance abusers that will help to provide clarity, understanding, education, prevention, and awareness. The disease of addiction impacts the whole family and the community. I’ve witnessed the wreckage and the death from addiction. My goal is to educate, make families aware, and have prevention become a priority. I started writing poetry about twenty years ago when a friend overdosed from drugs and died. I began with articles, then books. I love to write and teach! Today, with the drug epidemic, it’s about education, awareness, and prevention to help save lives. When I was seven years old, I accompanied my mother to many twelve-step recovery meetings and witnessed the miracle as it changed her life and mine. A few decades later the twelve-steps saved my life, my brother’s life, his wife’s life, my uncle’s life, and countless friend’s lives. I want this book about the drug epidemic to do the for addicts who still suffer. Interview with Author – Rev. Dr. Kevin T. Coughlin Ph.D.